The Eighth Doctor audios present a wholly unique situation and opportunity for Big Finish. Even with the audio-exclusive companions that each of the other classic Doctors now has in tow, those eras are still at least somewhat bound by televised continuity. There are, of course, ways in which the continuity could be skirted or bypassed altogether, but that’s not a decision that needs to be made with the Eighth Doctor era. Charley and C’rizz are both open books with no guaranteed survival at the end of their stories. Despite Big Finish’s reluctance to part ways with Charley in ‘Zagreus’ and the relative new addition of C’rizz to the team, it’s still a shocking twist- albeit one that’s completely undone by story’s end- for new writer Gary Hopkins to kill off both companions and to handle the Doctor’s emotional response to the dramatic turbulence he experiences as a result. 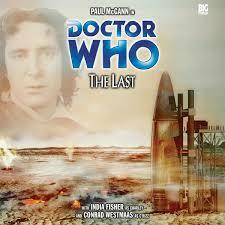 Accordingly, this is a script that makes incredible use of Paul McGann’s superb talents. After Charley is injured and paralyzed, the softer and more romantic side of the Eighth Doctor shines through as he optimistically supports her and tells her she’ll be fine. It’s a very poignant and touching moment and perhaps explains why his reaction is rather more subdued when Charley dies and he briefly encounters her ghost, quickly shifting his attention to keeping C’rizz and himself alive rather than lingering over the fallen. With first Charley and then C’rizz dead at the hands of Excelsior piled on top of the lost TARDIS and the entrapment outside of his own universe, the Eighth Doctor here is unequivocally at the lowest point emotionally that he’s ever been written. While the Doctor of the past would give a rousing speech and do everything in his power to stop Excelsior, here he has little recourse emotionally other than to disparage her. By the time he realizes what is really happening on Bortresoye, the Doctor is ready to accept death as an escape, and it takes very little prompting from Landscar for him to nonchalantly commit suicide to start the cycle anew, hitting a reset button of sorts in the process. However, the Doctor is such a powerful figure that inspires so much hope that, even with the breaking down of the character done in this story and over the previous series, it unfortunately just doesn’t fully resonate that he would so quickly choose this option given the situations he has escaped from before this. India Fisher is quite engrossing as the paralyzed Charley here, not when she tries to put on a brave face and act as if nothing is bothering her but more when she starts developing suicidal thoughts after declaring that she is utterly useless in this form. The scenes in which she berates the Doctor for saving her instead of the nurse and in which she asks the volatile C’rizz to perform a mercy killing as he did for L’da are particularly powerful, though any added fallout is cut short as Excelsior smothers her with a pillow. The script is quite good at portraying the desolation and horror of the nuclear holocaust on Bortresoye, but unfortunately Caroline Jones’s villainous leader Excelsior fails to match that horrific subtlety, verging into clichéd and pantomime territory on multiple occasions. She chooses to disregard the truth in order to satisfy herself that everything is going well, but her vanity and dialogue simply make her difficult to accept as a competent leader, even when it is revealed that she’s not as manic and crazy as believed. The backdrop of the nuclear destruction is incredibly depressing and even brings about a quick change in the usually jovial Doctor who plays it straight and tells the Ministers of War and Peace Voss and Tralfinial- played very well by Ian Brooker and Robert Hines, respectively- the truth about his companions and himself right from the start, not playing any games as he realizes the plight of the situation. The simmering rage never leaves him as he later intensely berates them for choosing to go to war and creating the planetary destruction instead of opting for peace, not listening to their half-hearted counterpoint that their pre-emptive strike was meant to avoid war. Still, there are some very intelligent concepts in play here, and the revelation that Landscar is a manifestation of the living planet Bortresoye itself is immensely satisfying, making sense of seemingly disparate bits of dialogue throughout the story. The fact that Bortresoye is the planet on which the zones have been placed gives the impression that true progress is being made and the Divergent arc is finally starting to reach its end. Unfortunately the reset button aspect is an overused and underwhelming device whenever it appears, and it again undermines the dramatic temporary fates of the companions. However, the rest of ‘The Last’ is quite effective and leads nicely into the upcoming ‘Caerdroia’ as the Doctor combatively confronts the Kro’ka once more and becomes convinced that there is a an even bigger and more threatening force behind the scenes that he has not yet met.